At Energy Energy Design, we spend quite a bit of time researching our clients’ market spaces and competitors. 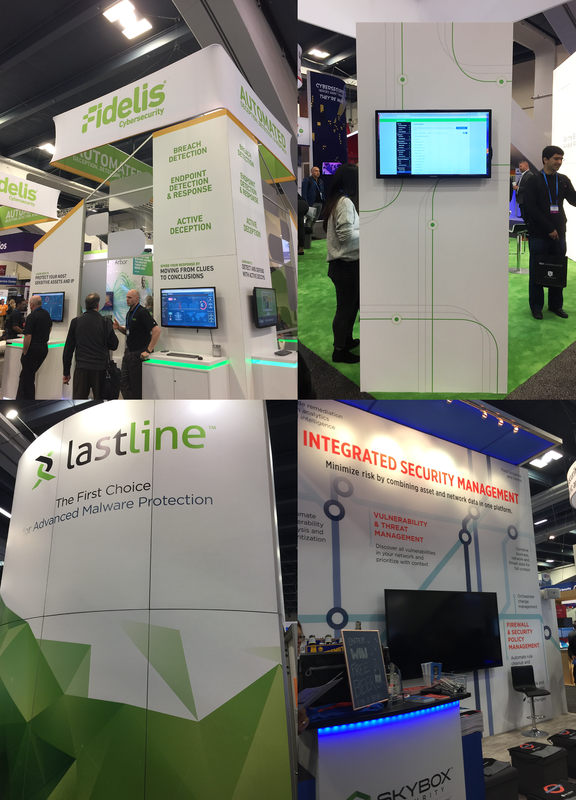 At last week’s RSA show in San Francisco, the premier security industry event, we looked at the visual identities and trade show presentations of hundreds of companies. One thing stood out clearly—almost none of the vendors stood out! Everything looked and sounded the same, down to the colors, graphics, and product descriptions. How can vendors expect potential customers to even begin to narrow down the best solution? No amount of coffee, candy, or glowing bouncy balls can help visual overload and lack of differentiation. Companies still rely on their customers to sort through Gartner reports, dig through white papers, compare demos, and attend never-ending series of webinars. They forget that customers just want to solve problems—not research technology. And the truth is, most customers have very lean security or technology teams and no time or resources for conducting POCs between multiple options. So how can vendors attract and build relationships with the customers and partners they need? Part of the answer lies in taking a holistic approach to their visual identity and design. Design leadership is a powerful differentiator, but few companies understand its power. They conduct initiatives when needed and when budget allows. They don’t integrate or communicate their strategies effectively with the people who can accelerate their success—marketing, public relations, sales, and partners. Tech companies in particular are notoriously fickle with agencies, changing often and not giving the agency and its work the time it takes to penetrate a crowded market and build a presence. Visual and messaging approaches that change every few months, or even every year, create market and positioning confusion—not clarity. We understand that startups, especially, can’t onboard an in-house design leader and team. But you don’t have to. Outsourcing visual brand development to one creative team—start to finish—is a strategic decision for growing companies committed to building solid brands. Executive level commitment to visual branding, design, strong competitive messaging, creative copy—and some personality—will set you apart from competitors. Design leadership makes it much easier to attract customers who will quickly understand how your offerings solve the problems they’re grappling with.